April 15 – Standard Liege’s home league game against rivals Anderlecht was abandoned in the Belgian top flight plays-offs after just 30 minutes following flares thrown by visiting supporters. The Brussels-based team will be slapped with a fine and potentially a 5-0 forfeit score. Standard Liege had taken a 2-0 lead inside the first 30 minutes after goals from Razvan Marin and Paul José Mpoku from the penalty spot. 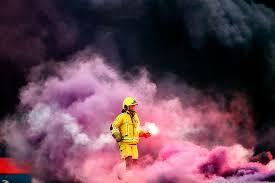 That scoreline infuriated the away supporters, who have painfully endured their club’s poor form during the play offs, and they vented their frustration by pelting the pitch with flares and smoke bombs. The game had already been interrupted before referee Erik Lambrechts called the match off. Liege’s Alen Halilovic had a goal ruled out by the video assistant referee before Marin did break the deadlock, the trigger for Anderlecht fans to cause their mayhem and for the referee to take the players off for the first time. After the restart, Liege were awarded a penalty when VAR ruled that Kara Mbodji had fouled Moussa Djenepo in the area. The Anderlecht player was sent off for a second yellow card and Mpoku converted from the spot. The away fans responded by setting yet more flares on to the field forcing Lambrechts to abandon the game. Anderlecht will face a fine of €50,000 over the suspension of the match. That fine still needs to be ratified by the Pro League’s board. They are also likely to forfeit the game 5-0. It would be the first time since 1963 that Anderlecht have lost four consecutive league games. Anderlecht are currently fifth in the play-offs table and in danger of missing out on a European qualification for next season.